By attending the screening of "TWO LOTTERY TICKETS", you will be able to participate in the Q&A session with the main cast - Alexandru Papadopol. Dinel, Sile and Pompiliu, three men from a provincial town of Romania, win the big lottery prize. But very soon the lottery ticket gets stolen, so the three characters start a journey to recover it. 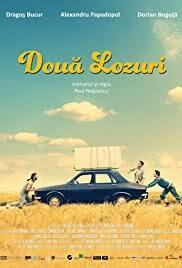 Inspired by the well-known short story of Romanian playwriter Ion Luca Caragiale, the film is a timeless situation comedy.